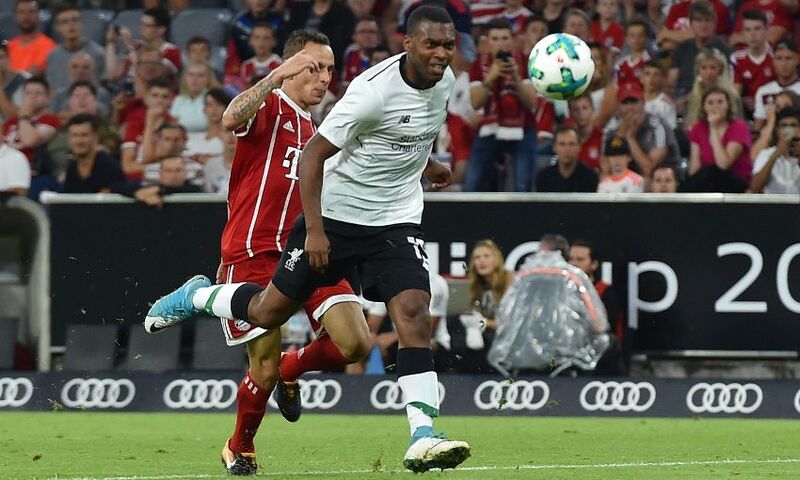 Daniel Sturridge plotted his lobbed finish against Bayern Munich before he even stepped onto the pitch at the Allianz Arena. The striker sealed an excellent 3-0 result for Liverpool in the Audi Cup with an exquisite dink over the goalkeeper late on, having raced through to reach Ben Woodburn’s pass. Sturridge – who pulled up with a thigh injury in scoring the goal that Jürgen Klopp hopes ‘is nothing serious’ – later revealed the inspiration for the strike that sealed a place in the final against Atletico Madrid. “The first time I was running through, I wanted to do that but he didn’t come out,” the No.15 told Liverpoolfc.com in Germany. “I was watching from the sidelines and I remember Mo [Salah] went running through on goal and the ‘keeper went down really early, so before I even came on I was thinking if I run through and I’m central, I’ll try to chip him because he goes down quite quickly. Liverpool had assumed command of the contest in the first half and were in front within seven minutes courtesy of Sadio Mane’s left-footer across the ‘keeper. Mohamed Salah soon nodded in a second for Klopp’s men, his fourth of pre-season already, as the visitors created a plethora of chances against the Bundesliga giants. “It’s brilliant. We’re always threatening the opposition, running through on goal,” said Sturridge. The Englishman was upbeat as he reflected on the victory, despite the late injury which he feels ‘will be OK’, and reiterated his desire for the new campaign after a productive summer. He added: “I’m feeling great. I put in the work; I trained a lot in the summer in LA and I’ve not missed many sessions here. We’ve done triple sessions. I’ve pretty much trained every single session.